DO YOU GET LOW BACK PAIN WITH DEADLIFTS OR KETTLEBELL SWINGS? 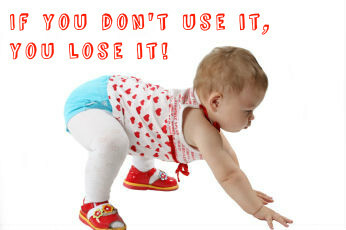 Studies done on low back pain show that the pain is often caused by losing the ability to move through the hips. I see this all the time in clients and always have to re-pattern their hip movement to save their backs! Learn how to move before you learn how to be strong! If you'd like to learn how to deadlift or kettlebell swing then check out our video downloads on these topics. Don't sacrifice your lower back for Deadlifts or Kettlebell Swings unless the movement has been broken down and taught to you effectively and you can carry it out extremely well. It is no secret that excessive use of high heels will lead to not only foot and lower leg conditions but it will have a negative impact throughout the whole body. Walking in high heels shifts the natural posture of your spine and creates an increased lumbar lordosis (natural curve in the lower back). It also shifts excess weight into the knees and does not allow your calf muscles to elongate fully back to their natural length, therefore creating a shortened position of the calf muscles over time. Not to mention the changes in the feet from being scrunched and jammed into tiny shoes that are usually quite narrow towards the forefoot. 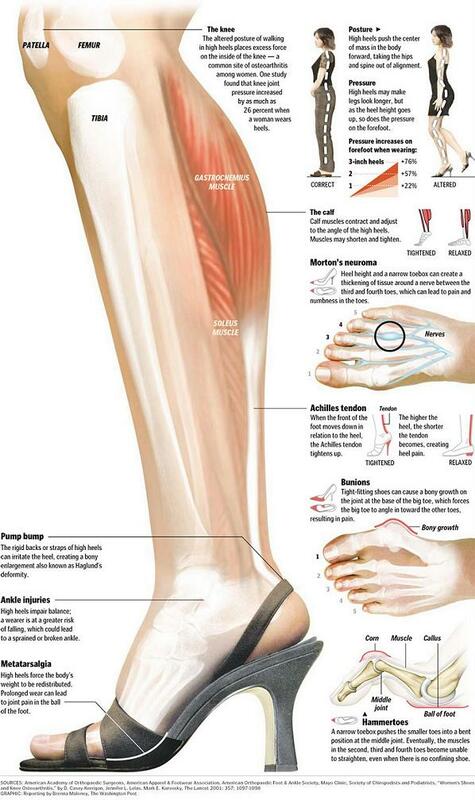 Some of the common conditions that develop as a result of wearing high heels too often. Even Victoria Beckham has hung up her high heels in exchange for more natural footwear. More and more celebrities and ladies alike are moving towards flat shoes to save their overall health. Read more about it here. Just disregard the part in the article where Doctors suggest a one or two inch heel. This is rubbish and makes no sense! I personally cannot remember the last time I found it necessary to put a pair of heels on. Barefoot is how I spend most of my time these days. I am lucky enough to work in my own studio space where myself and all my clients remove their shoes as they walk in. The best footwear you can have is none at all. If you need help with your posture or suffer from foot or leg pain, whether or not you are a high heel victim, then we can assess you and design a specific programme that you can carry out at home to move you out of pain. Incorrect swinging (as seen in first half of clip) can cause lower back pain and injury. Swing with the hips and not the lower back. Neutral spine (including neck), grounded feet, powered hip hinge, functional breathing.